Dr. Behram Kursunoglu was the Chairman of the Board for the Center for Theoretical Studies at the University of Miami. The papers consist of letters of communication between Kursunoglu and the professors that lectured at the Center to faculty and students, research plans, video-cassettes and audio-cassettes of the lectures, and publications containing the text of the lectures. Many of the lectures concerned high energy physics, theoretical chemistry, neurosciences, nuclear physics, and issues pertaining to energy problems. Among notable participants were the physicists and Nobel Laureates Albert Einstein, Richard Feynman, Robert Oppenheimer, Francis Crick, and Murray Gell-Mann; the member of the Florida House of Representatives Dante Fascell; and Richard Kennedy, the U.S. Ambassador At Large for Nuclear Energy. Murray Gell-Mann, of California Tech. Kursunoglu, B. 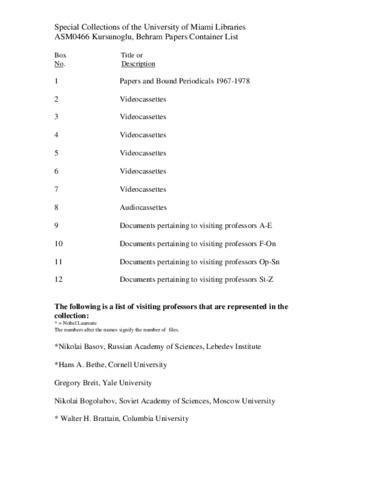 Papers Finding Aid © 2009 University of Miami. All rights reserved. Requests to reproduce or publish materials from this collection should be directed to asc.library@miami.edu.